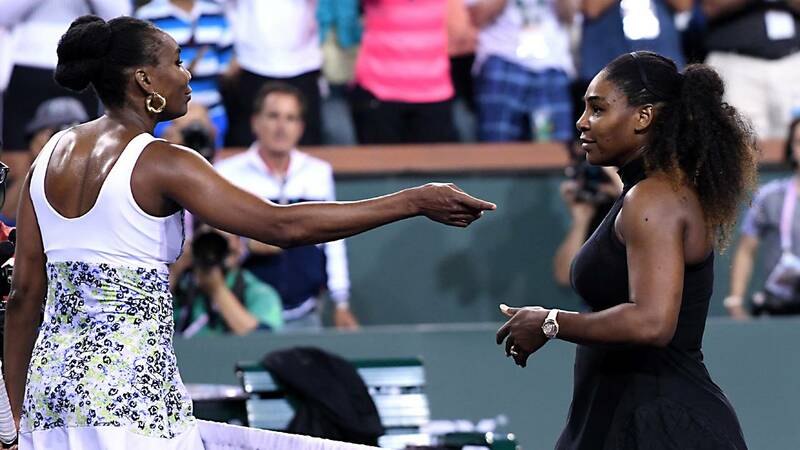 (CNN) - Serena Williams' first official tournament since becoming a mom in September was cut short by older sister Venus in Indian Wells. An aunt, yes, but Venus the tennis player put aside feelings of family love to win 6-3 6-4 in the night session Monday in the California desert, serving well for the most part and highlighting how Serena is finding her way again on the tour as she combines motherhood with the demands of professional sport. It was Venus' first victory over record 23-time grand slam winner Serena in their last four meetings but Serena still leads their head-to-heads 17-12. It was also their first duel at Indian Wells, 17 years after Venus pulled out of their semifinal with a knee injury. That triggered ugly scenes, as their father Richard said he was racially abused by fans when Serena then played -- and won -- the final against Kim Clijsters. Belgium's Clijsters appeared to be the fan favorite that day, despite the fact the siblings grew up close by in the Los Angeles suburb of Compton. Serena didn't return to Indian Wells until 2015, with Venus not coming back until a year later. Asked if playing Monday brought closure to what happened in 2001, seven-time grand slam champion Venus replied: "It never crossed my mind." But Venus, 37, did have a think of what made the difference between the sisters on court in the third round, their earliest tournament battle since meeting in the second round at the 1998 Australian Open because Serena is now unranked. "I have had a few more matches," Venus told reporters. "Even though I haven't even played that much this year, the matches in the last year count." Once Venus saved break points in her first two service games, she got into a groove on serve and broke for 4-2. The momentum stayed with Venus and she raced out to a 5-2 lead in the second but struggled to close things out. She saved a break point at 5-4 though with a potent serve into the body while another big serve clinched victory on a second match point. Serena is famed for some of her comebacks but Venus indeed held firm. The sisters -- as ever -- exchanged a hug at the net. Serena won only half of her service points overall -- it is much, much higher when her serve and game are working, even against Venus -- and committed 31 unforced errors to go along with 22 winners. She lamented missing shots she said she would make 10 times out of 10 in practice. Venus meanwhile was the more solid, striking 19 winners and 21 unforced errors in the tricky conditions of Indian Wells, where the balls zip through the air but then are tempered by a slow hard court. "It's definitely not less disappointing," Serena said as she reflected on the defeat. "I wish it were, but it's not. But then again, I wish it wasn't. Then I wouldn't be who I am. Yeah, so I just have a long way to go, and I'm looking forward to the journey." "l'll get ready for (my next tournament)," added Florida resident Serena, who will compete at one of her favorite events, the Miami Open, later this month. "I have a lot to improve on. It's good that I don't have to say that this is the best tennis I have ever played and I lost. My room for improvement is incredible. "So I have just got to keep saying each tournament my goal is just to be better than the last, and I don't -- definitely don't want to go backwards. I just want to continue to go forwards. I think as long as I can do that, I will keep getting better." Venus still has to go forward in in Indian Wells, whereas many of their previous tussles have taken place in finals and thus would have seen the victor hoist the trophy. Such was the case when they last squared off at the 2017 Australian Open, with Serena prevailing in the early stages of pregnancy. Venus thus wasn't dwelling on her win Monday. "Honestly have to get focused for the next match," said Venus, who plays 21st seed Anastasija Sevastova on Tuesday. "I'm playing a completely different player, new challenges. I really already was resetting, because the tournament is far from over." It is for Serena but she is sure to find herself in familiar surroundings -- the latter stages of tournaments -- soon enough.